Prescott, George B. Appleton, 1879. Hardcover: The cloth on the top of the spine and front cover are rippled, ; the covers are worn and hinges cracked. The folding plate in rear is in good condition. Niaudet, Alfred; translated by L. M. Fishback. John Wiley & Sons, 1884. Third edition. Hardcover, 7.5" x 5", 266pp. Reprint of Papers on Electrostatics and Magnetism by Sir William Thomson (1872). original binding, worn. Hinges cracked. This is a neat book of every imaginable aspect of electrical engineering in the 1950’s with lots of illustration, details, theories, application data, and so much more. There is lots of interesting text with lots of indepth information and exhaustive research, great for reference, slightly dusty and dirty from long storage. 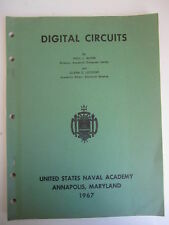 Digital Circuits, by Paul L. Quinn and Glenn E. Leydorf, staple-bound soft cover, 5-hole punched, United States Naval Academy, 1967, with about 220 pages give or take. Minor blemishes, corner fold to one page in the beginning. BELL, ALEXANDER GRAHAM. Norwalk, CT: Easton Press, n.d. Limited Edition. One of an unspecified number of copies. Bound in black cloth with gilt stamping without dust jacket as issued. Herbert Teager was also an researcher and instructor at MIT. The only mark inside is the stamp of Prof. Teager and occasional evidence of reading. Electrical engineering book that peeks into the beginnings of modern computers. A fairly rare classic and important work. Operational Circuit Analysis, hard cover, by Vannevar Bush, Eng. Inside covers and pages are nice w/moderate tanning, Owners mark stamped on 1st page. This listing is for a 1935 eleventh impression hard bound 758 page first edition (no dj) of Practical Radio Communication by Arthur R. Nilson and J.L. Hornung. It was published by McGraw-Hill. THE OSCILLATOR AT WORK. Many newer and less familiar oscillators, as well as the more standard types, are described in detail. The special tests, which modern receiver service data make desirable, are described in detail. I WILL ALWAYS POINT OUT ANYTHING AND DO MY BEST TO DESCRIBE AS MUCH AS POSSIBLE. CLEAN TIGHT CRISP STATED FIRST EDITION HAS A COUPLE OF SPOTS ON COVER BOARD IF HELD AT ANGLE TO THE LIGHT OTHERWISE PERFECT. Harvard SYNTHESIS OF ELECTRONIC COMPUTING AND CONTROL CIRCUITS, 1951 SCARCE! A collection of papers representing ten years of experience and research by many computer pioneers. Contains all the basic concepts that computers were later based on; logic and switching functions, accumulators, counters and multiple-output circuits. Connecting Induction Electrical Motors Book A. M. Dudley 1936 McGraw Hill. Book is in very nice condition. No scuffs on covers or wear on top or bottom of spine. Basically looks new. Has a faint price written inside front cover and a Holmes Book Co stamp inside back cover as shown in photos. Shipped with USPS Media Mail. Illustrated with circuits and design. ** FREE SHIPPING!! ** vintage book/manual: "Radio Operating Questions & Answers"
Also has an Air Force… sticker inside front cover. STEREOPTICS - AN INTRODUCTION by Leslie P. Dudley. London: MacDonald & Co., 1951, 1st Edition. Blue cloth binding, brown dust jacket. 112 pages. This book is in good condition with light bumping to corners of covers. Проблемой была передача информации между континентами — каким образом протянуть более 3000 км (от Европы к Америке) провода через Атлантический океан?. Удивительно, но именно так и решили поступить. В результате появился «клубок» кабеля весом в 3000 тонн (состоящий из 530 тысяч километров медной проволоки), который к 5 августа 1858 года успешно размотали по дну Атлантического океана крупнейшие на тот момент военные корабли Великобритании и США — «Агамемнон» и «Ниагара». RCA, 1964. Hardcover: VG /VG. Pembroke, MA. 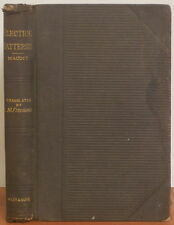 1948 Vacuum Tube Amplifiers Massachusetts Institute of Technology Radiation Laboratory Series #18 1st Ed. 743 pages. Ex-Military (Ordnance Corps) library. Front boards have partially separated from the pages inside, but are still attached fairly strongly. No loose, torn, or missing pages. Some markings, stamps, and writing. Covers have scuffs fading, and adhesive residue. Shipped with USPS Media Mail the first Monday after the sale. By A. Frederick Collins, Revised by Robert Hertzberg. The Radio Amateur's Handbook. 12th Revised Edition - 1970. 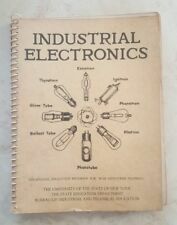 This is "Standard Handbook for Electrical Engineers" in an eighth edition published by McGraw Hill in 1949. This edition features 25 sections (easily accessible with thumb tabs on the page block) dealing with every aspect of electrical work - state of the art in 1949! 1990 (2, half year each, about 350 pages each). 1991 (full year of about 450 pages). 1992 (full year of about 450 pages). 1993 (full year, about 500 pages. Minor blemishes, occasional light wrinkling. ). Stated First Edition First Printing. This book is in very good condition, no markings on pages, covers are in very good condition as well, only a few minor scuffs due to regular use. Nothing excessive. Fry, William J., Taylor, John M., Henvis, Bertha. New York: Dover Publications, (1948). Revised and Enlarged Second Edition. Offsetting to the rear endpapers. In the original dust jacket with a list of Dover titles on the reverse. Good condition. Excellent graphics. See photos. Title: Electrical Transmission and Distribution Reference Book (1944) 3ed. Type -Oversize hardcover, Brown cloth, faded gold embossing, 630 pgs. Coyne electrical trouble shooting manual. Our goal is to provide you with a Superior Product and Excellent Service. from 10:00 AM to 5:00 PM. DX y DXISTAS, by Juan Jose Rosales Fernandez, signed by author with dedication to owner, in Spanish, softcover, I see no publisher listed, undated but recent, circa 1990s?. With 253 pages. Very nice inside, very minor wear. Conference on Cerebral Systems and Computer Logic, sponsored by California Institute of Technology and The Rockefeller Foundation, hard cover, 1960, with 72 pages. A collection of conference speeches about cognition, vision and pattern recognition in machines, and so forth.